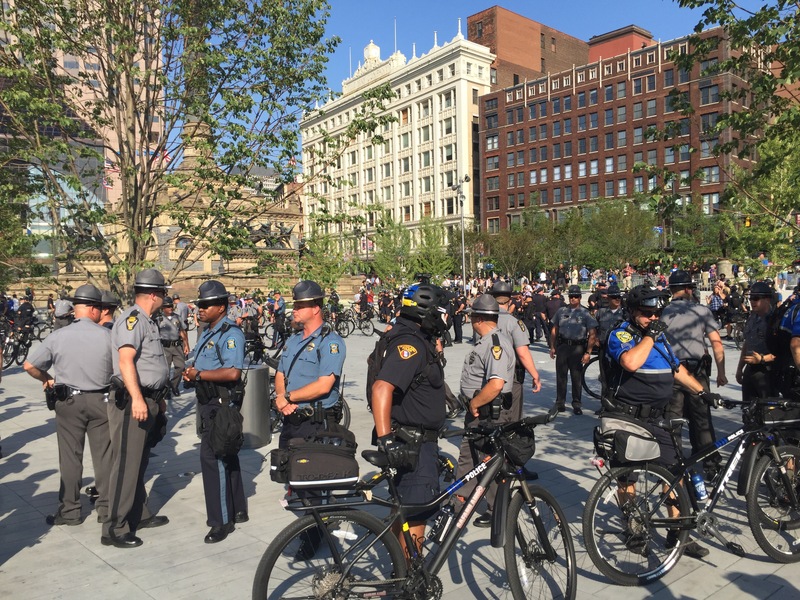 For the past hour and a half, police have gradually pushed demonstrators and other members of the public out of the center of Public Square in Cleveland, the site of 2016’s Republican National Convention. A local ABC reporter told (about 4:30 in the Periscope video) her TV audience that police used a “T-Formation,” though it was difficult to make out the T-shape from any side of the park. Earlier, several different groups were demonstrating, including the Industrial Workers of the World, young people chanting “Black Lives Matter,” and a few Jesus proselytizers. At the beginning of the police action, an officer informed me as I was leaving the square that I wouldn’t be be able to return. By the time I began heading back to the center, police had cleared the area. Minutes later, police began to loosen their formation, letting people back into the center again. As I began drafting this post, a line of bicycle officers rushed back into the center to reclose the square. There were at least three officers at the center with riot gear: plastic face mask, helmet and military-style backpack. As of publication (about 6:05 p.m.), several of the bicycle officers rushed out heading east on Superior Avenue. 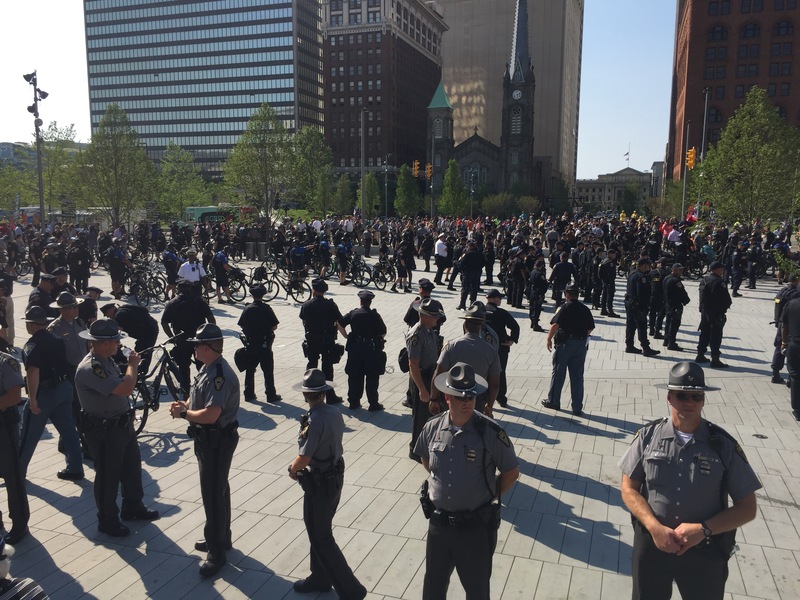 A line of white-uniformed officers have entered the center of the square. Several passersby have said, “good luck, guys” to the line of officers. This entry was tagged 2016 Election, 2016 Republican National Convention, Cleveland, police, Protest. Bookmark the permalink. This is called crowd control and is entirely necessary when you’ve got the KKK, Westboro Baptist Church, and BLM all protesting in the same area. Stay safe mate.